Thanks to Bob for sending this postcrad with scenes of London. London’s metropolitan area lies within the London Basin of the River Thames, this is why almost all of London is flat. There are some minor hills some as Ludgate and Tower Hills which are made from gravel deposits of the river, think of ancient levées, and part of the south of London lies on the beginning of the chalk slopes of the North Downs. The River Thames has a wide estuary and is navigable (can be sailed along its course by ships), from the sea right up to the city and beyond, this means that when London was first established one of the most important locational features must have been its location as a port. 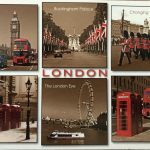 Other features of London will be covered when other postcards are received from there.